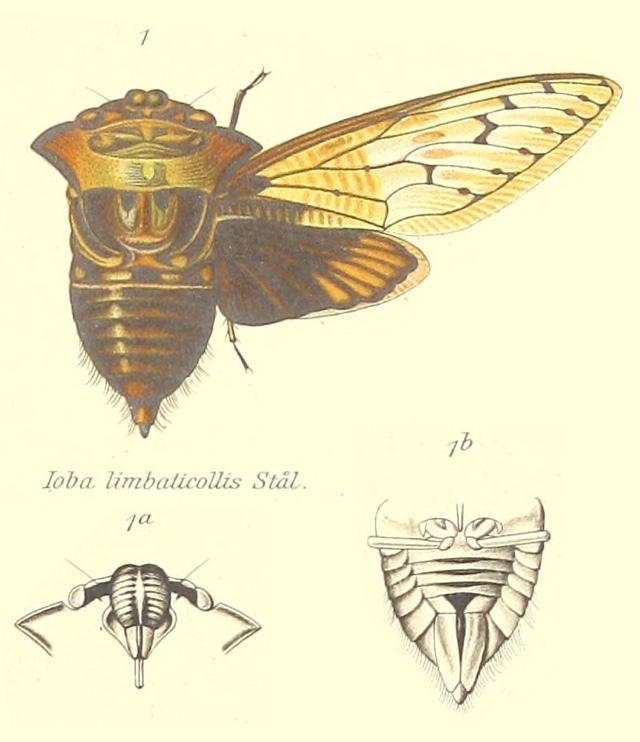 Ioba limbaticollis (Stål, 1863). Sub-Saharan Africa, West Africa, including Nigeria, Ghana, the Democratic Republic of the Congo, Central African Republic, and Ivory Coast. This cicada has an amazing pronotal collar. Characters. — Head (including eyes) wider than the base of the mesonotum, not truncate anteriorly, but with the lateral margins of the vertex a little oblique on each side and the front prominently produced; pronotum transverse, its posterior margin only a little less in length than the vertex, the lateral margins strongly and angularly produced on each side, the angulations medial, their apices when the tegmina are expanded reaching near or to about the end of the basal cell; mesonotum about as long as the pronotum; anterior femora with; one or more distinct spines, posterior and sometimes intermediate tibiae spined on apical areas; metasternum elevated and centrally sulcated ; tympana covered; opercula short, broad, their apices more or less convexly rounded; rostrum reaching the posterior coxae; tegmina with the basal cell broad, irregular, with four, or sometimes five, angles ; ulnar veins widely separated at their bases; interior ulnar area somewhat broadened at apex. 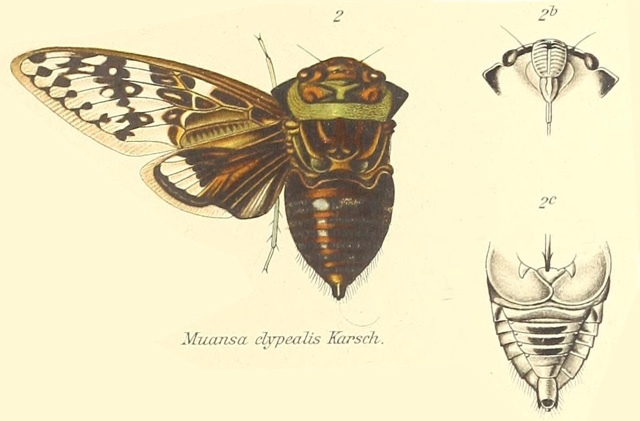 Muansa clypealis (Karsch, 1890) is a visually amazing cicada, with a remarkable angular pronotal collar and almost butterfly-like wing inclusions. It is found in Sub-Saharan Africa/West Africa, including the countries Cameroon, The Central African Republic, The Democratic Republic of the Congo, Nigeria, and Zaire.